Sometimes it takes a tragedy that really hits home in order to lead to meaningful change. As advocates for safer roads who believe that commitment includes the full-range of travelers, the Brod Law Firm team is always saddened to hear about pedestrian deaths. We believe our work as a San Francisco pedestrian death law firm not only compensates victims but deters future tragedies. Our hearts go out to those impacted by the recent tragedy and we hope the death of a City Hall employee inspires meaningful changes that will make the streets safer for everyone. As CBS San Francisco reports, officials continue to investigate the collision between a motorized cable car and a pedestrian on Thursday October 23. It was approximately 11:30 A.M. when the cable car struck 68 year-old Priscila “Precy” Moreto in a crosswalk near San Francisco’s City Hall, by the intersection of Polk and McAllister streets. Moreto, an accountant and longtime employee of the City Controller’s Office, was taken to the hospital in critical condition and died as a result of her injuries. Investigators say it is unclear why the cable car’s driver did not see Moreto. The vehicle, which was operating as a tour bus, is owned by Classic Cable Car Charter. Managing Partner Bob Salmon told reporters that he believes there was a separate tour guide and that the driver was not serving as the tour’s narrator, but he could not confirm that with full certainty. Notably, it is legal for tour bus drivers to wear headsets and narrate while driving. Police report that something distracted the driver who said he did not see Moreto until she was underneath the vehicle’s wheels. Passengers had little to add, saying they were looking at City Hall at the time of impact. Mayor Ed Lee referred to the incident as tragic, adding that it “reminds us that we all have a shared responsibility to protect and care for one another on our busy streets.” He also called it an example of the potential dangers on city streets and urged voters to pass Proposition A. Lee said that the measure calls for a $500 million transportation bond with $300 million focused on pedestrian safety including added signs and signals. 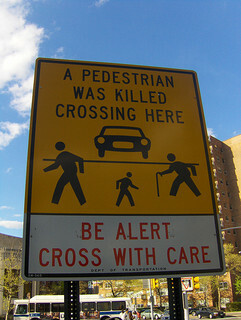 A signal is due to be installed next year at the crosswalk where the death occurred. Supervisor Scott Weiner also called for increased traffic enforcement to encourage all road users to be on the lookout and navigate the city with care. When we are brought in to represent the grieving family in a wrongful death case, we typically begin by conducting a thorough investigation into the events. We gather as much evidence as we can as quickly as we can to avoid evidence being lost or memories beginning to fade. From the facts, we consider all possible legal claims and all potential defendants. We cannot say what claims are appropriate in the recent pedestrian fatality without all the facts, but a similar scenario might lead us to consider potential claims against the driver individually, the tour company, or even the City. Our primary goal as a Northern California wrongful death law firm is to ensure our client(s) are compensated for their loss (see California Jury Instruction 3921 for details on damages in wrongful death cases involving adults). Prevention is often another goal in our practice. Many of our clients express a desire to help prevent others from suffering a similar loss, a goal that can help give meaning to their loved one’s passing. We hope the loss of an employee helps push the City to make safety a top priority and allow a public servant to continue to serve the City even after her passing.